This is probably the biggest hoax in the history of Facebook. It happened in France and is one of the most discussed stories in the French blogosphere right now. 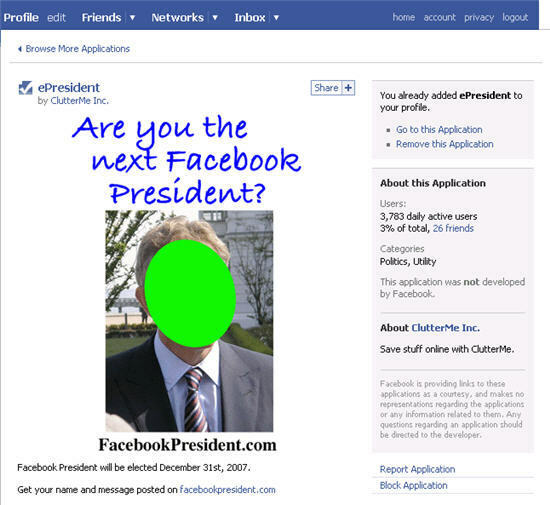 It all started a few weeks ago with a simple third-party Facebook application that was aimed at designating, every quarter, a new “Facebook Worldwide president”. 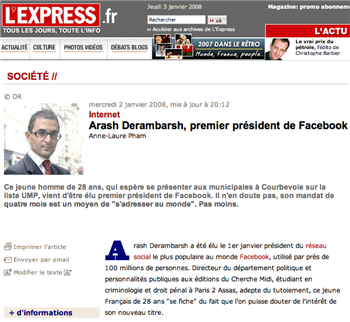 A young 28 year-old French man by the name of Arash Derambarsh decided to run for the presidency believing this was a real election (or faking to believe) and started to invite his friends and even created an official program: stimulate tolerance across religions, fight illiteracy, and promote French culture worldwide. Until then, there was nothing really worth talking about. But here is the crunch: Arash landed at the top of the application and became “president” (for the record, during the first session the application had been installed 140k+ times and the “candidate” received officially 9k+ votes..). He used that information and got some coverage with French media that started to report the news and really believed that a French man had become the new worldwide president of Facebook without even taking the time to validate the facts or understanding what this title implied. Then the infernal spiral fired up and very serious TV channels and traditional media covered the story one after the other: TF1, LePoint, L’express, FranceInter, Le Parisien, …They all mentioned the story as if this was real: check it out for yourself. Arash is suddenly becoming a star in France, gets his page in Wikipedia (update: and now a Mahalo entry) and is invited to talk about his presidency and his program for a few days; public opinion is with him. The guy talks well, has some political track record and finally sounds credible. Of course Facebook has nothing to do with this, but nevertheless in some interviews Arash implies that he has a project with UNESCO and some backup from Facebook; he even declares that he has the power to reach, via a secret Facebook feature, close to a hundred million users, more than the French President himself. No one balks. Everyone buys it although this is really easy to fact check that Facebook does not have close to a hundred million users and even easier to validate the reality of this story with Facebook’s press department. 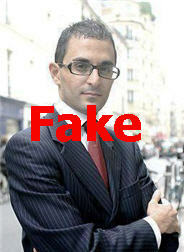 Arash is actually nothing else than the president of FakeBook. But Facebook users are not fools and a group arises, denouncing the whole thing. ZDnet France spots the hoax, bloggers follow up quickly and the truth comes to light. According to the inquiry made by ArretsurImages many journalists covered the news just because others did and because the “President” looked credible. And then finally a wave of new articles came back to the story explaining this was a fake and that Arash misunderstood the purpose of this election. Of course this is too late and the French press has been fooled all the way. Many tried to reach Arash for more details and reactions but without success. Did he do this out of pure calculation or was his ego responsible for the whole story? The most important point: A simple user managed to generate the biggest prank in the history of Facebook and the press bought it. Hilarious, ridiculous, but also worrying and sad for the French press (a big chunk of it) whose credibility has been hit hard.